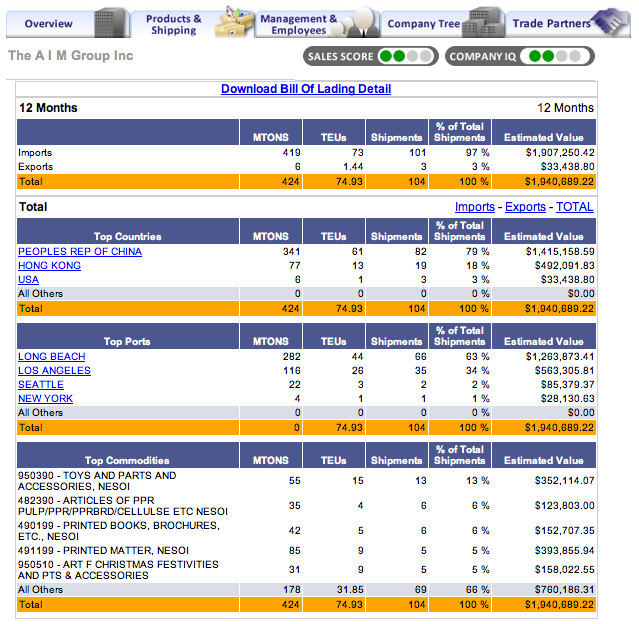 AIM Group is a small seemingly obscure company located in an office complex in Nashville, TN. They are a good bunch of folks that I had the pleasure of meeting a couple years ago. They keep a low profile. It’s hard to even find a website for them: even with a Google search. About all you can find out about them in public record is that they are a Stationery and Office Supplies Merchant Wholesaler, the names of the executives and their address and phone number. Like many trading offices, a certain anonymity is preferred. Basically, they are middle men, with established China manufacturing connections, catering to the lucrative Southeast Bible Belt Christian marketplace. They lubricate the logistical wheels of the import process: identifying, buying, shipping and supplying Christian retailers with toys, books and religious memorabilia. What they, and companies like them, are unaware of is that despite their attempts at anonymity upon which a good part of their margins depend, (keeping the connections to their foreign manufactures and logistic providers obscure), it is all an open book to those who have the tools and know where to look. Virtually, every waterborne import shipment into the U.S. is a matter of public record through the Freedom of Information act. The representative charts and information below are all available on any U.S. importer. Even in the case of Walmart, the largest importer in the world, who has made every attempt to suppress information about who their suppliers are, tens of thousands of shipments a month slip by the filters applied by U.S. Customs to accommodate their urgent and reoccurring requests to conceal such. Details on the 100 plus import shipments, including specifics on the products, estimated shipment values, foreign suppliers, addresses, weights, units as well shipping and routing information are all contained on the publicly available manifests. Look for yourself. Download and check out this sample Excel file. For example, one of the many listed foreign suppliers is Kwong Fat in Hong Kong. Easy. Tze Leung Wong is listed as Managing Director with about 30 employees. Address, phone and Duns information are immediately available as well as their shipment history to AIM Group and their other U.S. importing customers. Note they exported over 400 shipments to the U.S. over the last 12 months. Besides the AIM Group, other U.S. Customers include Blue Mountain Arts, Simon and Schuster, Barnes and Noble, National Geographic, Barrons, Borders, Penguin, etc. Such information is an excellent method of vetting potential foreign suppliers (by their shipment history and current customers), and potentially eliminating the middlemen and trimming margins. You can see details on their last 400 shipments into the U.S. by downloading this sample Excel file.